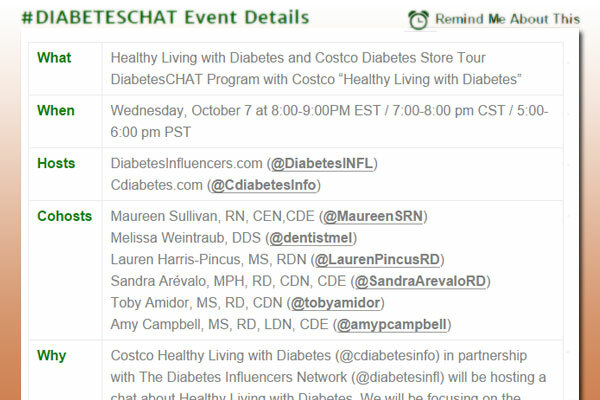 In October 2015, Costco Healthy Living with Diabetes (@cdiabetesinfo), in partnership with The Diabetes Influencers Network (@diabetesinfl), hosted a tweet chat on Healthy Living with Diabetes. The chat focused on the many products available at Costco, and how they can fit into the lives of people with diabetes and prediabetes. The event was cohosted by: Maureen Sullivan, RN, CEN,CDE (@MaureenSRN); Melissa Weintraub, DDS (@dentistmel); Lauren Harris-Pincus, MS, RDN (@LaurenPincusRD); Sandra Arévalo, MPH, RD, CDN, CDE (@SandraArevaloRD); Toby Amidor, MS, RD, CDN (@tobyamidor); Amy Campbell, MS, RD, LDN, CDE (@amypcampbell). Here are some of the questions and answers from that chat. What are some vitamins and supplements, helpful for people with diabetes, which can be found at Costco? Costco carries many quality vitamins and supplements for people with diabetes, including diabetes health packs, Nature Made brand vitamins, minerals and fish oil, Kirkland brand vitamin C (especially with cold season coming on), Zinc, and Vitamin D. Costco also carries ready-to-drink Glucerna shakes, specially designed for people with diabetes. People with diabetes should speak with their doctor or dietitian to determine the right vitamin or supplement for them. Will any of them interfere with my diabetes medications? They might. Always carry a complete and up to date list of all your medicines and over-the-counter and herbal supplements. Check with the Costco pharmacist for possible bad reactions or side effects. For example, the cranberry pill can interfere with certain medications. Don’t forget to check labels. Some vitamins or supplements might have added sugars which can affect glucose levels. What are some of the healthiest ingredients when cooking for someone with diabetes? Costco offers a large variety of fruits, vegetables, whole grains, lean meats, beans, nuts, and low fat dairy to make healthy meals for everyone in the family. Costco also carries many low glycemic, vegetarian and even vegan products. Find ingredients that don’t spike blood sugar, like fresh fruits, non-starch vegetables and whole grains rich in fiber. Also look for salt free seasonings and sugar free products. As with any healthy eating, it’s important to learn label reading and portion control. For a more detailed list of products, download the Free “Costco Diabetes Store Tour” eBook here: http://t.co/Ok3eiuvkH0. As a health professional, what do you buy at Costco to make sure your family eats a healthy diet? Fruit, veggies, milk, chicken, fish, pistachios, yogurt, chia seeds, peanut butter, hummus, popcorn, fresh and frozen salmon (Kirkland Frozen Atlantic Salmon!). Also look for low glycemic foods, like whole wheat pasta, wild rice, citrus fruits, berries, yogurt (no sugar added) and almonds. Tofu is very tasty, an excellent source of protein, and great stir fried with veggies. Costco offers a wide range of vegan, gluten free, low glycemic, vegetarian and fresh food options. There are so many choices at Costco! As someone with diabetes, what should I stay away from? Are you or a loved one newly diagnosed with diabetes? Read this quick-start guide for help in getting started living with diabetes: http://t.co/88G8fkRqTL. First of all, there is no need to completely give up the foods you love. A dietitian can help you learn how to still enjoy your favorites, in moderation. You should learn how to read labels and practice portion control. Limit foods with little nutritional value that can spike blood sugar, such as soda, candy and sugary desserts. And look out for bakery foods – they’re delicious but full of fat, sugar and calories! Muffins the size of your head are not the best choice – for anyone! What are some good healthy snack options at Costco? Popcorn, hummus with vegetables, guacamole or a Greek yogurt dip, apples with almond butter, or nuts. There are so many healthy food options – as long as they fit your carb budget and you eat in moderation! Glucerna and other ready to drink shakes help minimize blood glucose spikes. Keep nuts, fruit or low carb bars handy for when the “craving” hits. Remember, protein and fiber rich foods can help manage hunger. If you bake, use whole grain flour to make your own baked goods: it adds lots of fiber and great texture! I’m on a low carb diet to manage my diabetes, so I don’t eat many packaged foods. What are some good options? There are lots of carb controlled products available, and packaged food is fine as long as you read the label and ingredient list. Understand what’s in your food. Be sure to discuss your “low carb” choices with your health care provider or dietitian. There are critical differences between low and no carb foods, and you don’t want to cut out vital nutrients. Focus on protein and healthy fats such as avocado, hard boiled eggs and individually-wrapped cheese sticks. Vegetables are also a great low carb snack. Like crunch? Adding nuts to your cold cereal; they’re full of protein and heart healthy fats. What are the benefits of shopping at Costco for diabetes care products like blood glucose meters? 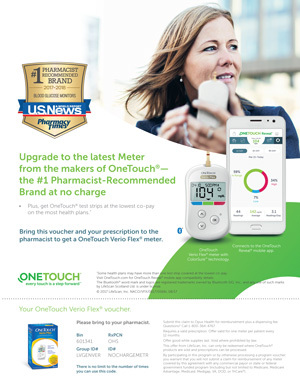 Costco diabetic supplies are very cost effective, and the on-site pharmacy can help guide your choices. Costco has excellent pricing on diabetes supplies as well. Check out the CMPP – Costco Member Prescription Plan – a benefit for Costco members. The Costco website has a dedicated section on diabetes, including information and valuable coupons. There are so many brands of diabetes care products. Who at Costco can help me find the right one for me? Your Costco pharmacist is your best resource! The Costco pharmacy can work with your health care provider or insurance company to assure that you get the best cost and choice on products. How do Kirkland brand products compare to the name brands? Kirkland and other store brand products are typically high quality yet more affordable than brand name products. What else should I look for at Costco? There is a direct correlation between diabetes and oral health, and gum disease can lead to a heart infection. So it’s important that you take care of your teeth. Visit your dentist regularly, and brush and floss every night. Costco carries toothpaste, dental floss, mouthwash and electric toothbrushes for much improved teeth cleaning. Stock up on extra toothbrush heads and change them as they wear out. Dry skin can be issue for people with diabetes, so pick up your favorite body lotion. And don’t go barefoot if you have diabetes! Costco has great selection of slippers for around the house.